What Is A “No Fee Promise”? Bart Bernard believes that his clients should be able to afford high quality representation without paying hefty upfront fees. His “No Fee Promise” is also referred to as a “contingency fee,” which means all legal assistance is provided FREE OF CHARGE until Bart Bernard secures a settlement or jury award on his client’s behalf. IF WE DON’T WIN, YOU DON’T OWE ANYTHING. Once Bart wins the case, a pre-agreed-upon percentage is deducted from the total amount to cover his services and you receive the rest. Should the case fall short, neither lawyer, nor plaintiff, receives any compensation, and you don’t owe anything. It may seem like a risky way to run a business, but Bart Bernard’s years of experience have taught him a lot about what it takes to win. Many personal injury victims have suffered large financial losses prior to the decision to file a lawsuit. Large corporations and wealthy victims may have the means to cover legal fees so they can prepare a strong case for court, but what about the average individual? No one wants to end up in a bigger financial hole due to the need for legal advocacy. What are the pros of a “no fee” promise? There are many costs associated with litigation that a self-represented plaintiff would otherwise have to pay out-of-pocket. This includes fees for expert witness testimony, court filing fees, court reporter fees, document acquisition fees, deposition costs, presentation expenses, and medical testing charges. Bart Bernard covers the cost of discovery, case preparation and court proceedings, so it’s one less concern. A personal injury attorney working on a contingency basis has a vested interest in winning maximum compensation for their clients’ cases, as most fees are based on a percentage of the amount recovered. 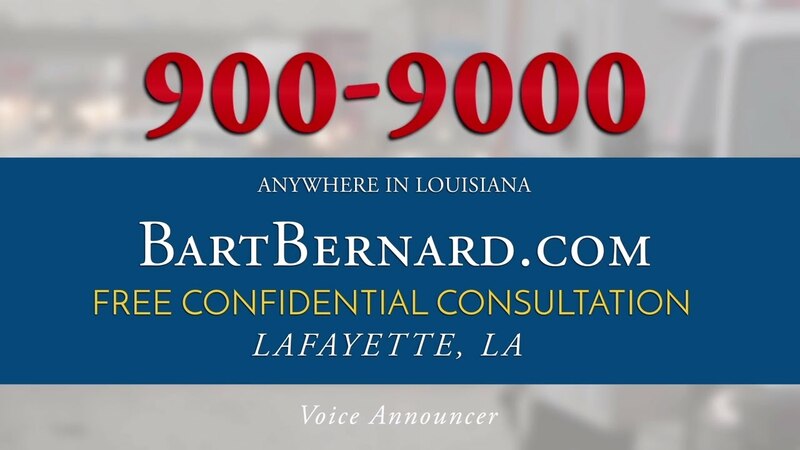 Since launching his own personal injury law firm in 1997, Louisiana Lawyer Bart Bernard has developed a reputation for success. He has secured millions of dollars for his clients with professional recognition as a member of the Elite Lawyers of America and the Multi-Million Dollar Advocates Forum. Fair legal fees are directly tied to the time invested, the services rendered, and the level of expertise provided. Experienced lawyers like Bart Bernard make use of extensive professional networks and know how to prepare a case in the most efficient manner. Ready to take the next step? Contact Bart Bernard for a free case consultation to learn more about his No Fee Promise and case-specific recovery potential.